Twice the effort, Twice the time? 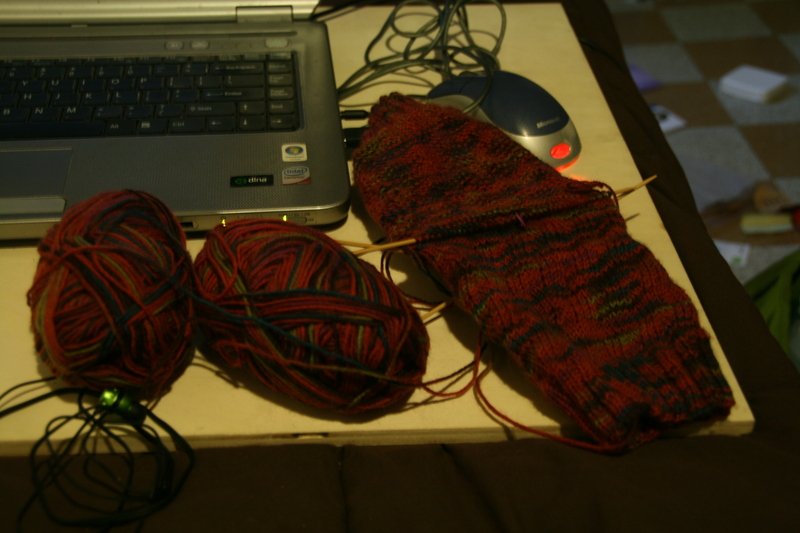 In my continuing saga of double knitting socks, I’m constantly pestered by crossing of stitches. Luckily, this GREAT knit entry on Knitty has helped me out tenfold. I’d say that I unconsciously chose a great yarn with this pattern; the pattern is visible but doesn’t overpower the awesomeness of the multicolored yarn. You can see that they’re taking me about 1.5 times as long as a normal pair of socks. But the way I see it, since I’m a knitter who always has difficulty starting the second sock, I might as well take a little longer, challenge myself a little more, and finish both thus resulting in a full pair. I guess the pattern isn’t fully visible, but oh well. Moreso, school, job applications/portfolio, and travel have gotten in the way of my knitting. Well, travel not so much, but the other two most definitely…hopefully this summer will be plenty fruitful knitting wise…. With some yarn I had purchased at De Afstap in Amsterdam, I decided to make some Mockery socks. I haven’t created my own pattern for socks yet and since such awesome sock yarn isn’t quite accessible to me right now (at least I haven’t found it), I thought, why waste it on a potentially disastrous pattern? Even before I came to Italy, I knew I loved sock yarn. My first experience had been with Lorna’s Laces Shepherd sock yarn and I immediately became a fan. However, coming here and not being able to ask for, much less find, sock yarn I almost forgot about how much I loved working with it. More on my international yarn experiences to come in a later post. 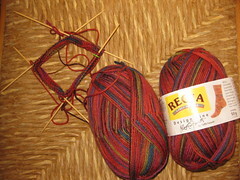 I used some Regia Design Line sock yarn in “Mirage Print Fire.” Moreover, I decided to attempt to double knit this pair. I had some experience with double knitting with the Raccoon Hat but not with socks…I’m sure there’s a huge difference. 1. Note the blue piece of scrap yarn tied around one of the strands. This is blue for a good reason: Blue = Back. Yup, this way when I realize blue is in front, something is really wrong there. However, it is super easy to slide the yarn down as I need to use it…let me tell you, possibly the smartest idea I’ve had thus far in my life. 2. Minimize the potential for crossing by keeping one strand on the left index finger and the other on the right. I believe this is combining Continental and English style but there is a good chance my jargon is completely wrong: I was never formally trained as a knitter, I just kind of explore and pretend that I do know. Hello knitting blog world! Recently discovering the world of knitting blogs after almost 8 years of knitting (wow, didn’t think it was that long), I’ve decided to jump on the bandwagon. Granted, I have been part of the blogisphere for a while, having a travel blog, tumblr, whatnot…but I never knew about the awesomeness of a knitting blog. After perusing one blog, I started linking to another, and another…and now I’m here! I’m currently a college student discovering the world. I began knitting in high school, though only recently began expanding my knitting to include items other than scarves and hats; I’d consider myself an intermediate-ish knitter. I thought since I get so much from the interwebs in terms of tutorials and patterns, why not contribute back since I’ve just started creating my own patterns? Let’s see how this blog thing goes; I’m quite notorious for starting blogs and not using them. Yay for knitting blogs!